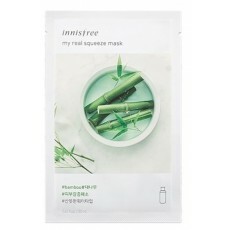 Enriched in bamboo extract and other fruit and plant concentrates, this face mask quinches the thirst of your dry skin, making it smooth and hydrated for the day. Easy and convenient to use, with its 3 layered structure that absorbs large amounts of essences to supply your skin with nutrients and moistures. It's a luxury spa affordable for everybody. After your cleanser and toner, carefully unpack mask and smoothen over face. Let it sit for 10-20 minutes. Take your time and relax. You can apply mask 1-2x a week or more according to your needs. For times when your skin feels tired or dehydrated, (or you yourself needs relaxion! ), sheet masks are most convenient way to bring back your skin health in as little as 10 minutes! For cooling effect, you can store the mask in the fridge before use.